Our traditional end-of-year round-up of Romero stories for the past 12 months reveals that, while Archbishop Romero slept the sleep of the just in his canonization cause this year, he remained “wildly popular” in the words of a Newsweek report. 2012 may be recalled as, «The Year of the Monument.» The year was notable for some unexpected Romero tributes, memorials and monuments that will cause his legacy and legend to grow. The tributes we consider below go beyond the now traditional commemorations of Romero held every year, including around the date of his martyrdom. The March tributes now include those organized by the Romero Trust in London. “This year,” the Trust reported, “there was a record number of special liturgies, masses, talks, film showings, workshops and cultural events held in Scotland, Wales and England.” Here in America, Notre Dame University held its annual Romero Days (see item no. 4, below). There were many other celebrations, too numerous to recount, but the March 24 Mass in San Francisco’s Cathedral for those affected by violence, was typical of the events. And the celebrations in El Salvador both in March, and for Romero’s birthday in August, also continued to grow. 1. Monuments by the Salvadoran government. 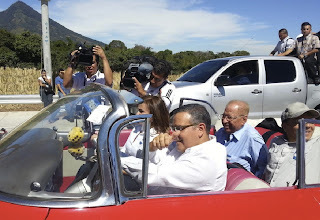 Unthinkable just five years ago, the center-left Salvadoran government of Mauricio Funes (pictured, driving along the new road with Archbishop Romero's brother, Gaspar) pushed his attempts to rebrand Romero in El Salvador, naming a new major traffic artery in San Salvador in his honor, and marketing a Romero City Tour that will take visitors to Romero sites in and around the Salvadoran capital city where Romero lived. The “Msgr. Romero Boulevard” was the highest profile construction project in El Salvador in the last decade and is the largest structure named after Archbishop Romero, anywhere in the world. The Romero City Tours have been promoted by the government in Italy and London to project a new image overseas. 2. Monuments by the Salvadoran Diaspora and others outside El Salvador. In California, the U.S. state with the largest Salvadoran population, the approval of a “Plaza Romero” by the L.A. City Council marked an important milestone for the local Salvadoran community’s growing clout and was an example of Salvadorans looking beyond their ideological differences to rally around Romero as a unifying figure. Another noteworthy tribute was the bust dedicated by the government of Panama. The unveiling was attended by the Salvadoran Foreign Minister and the Archbishop of Panama. 3. Romero’s statue in San Salvador. In his home country, Romero continued to slowly overcome the entrenched, cultural hostility of the far right. This was dramatized clearly when activists associated with the right vandalized Romero’s statute during protests related to a constitutional crisis in El Salvador. In the face of broad indignation among the general population for the damage, the rightwing Mayor of San Salvador, who aspires for the presidency in the next election, offered to have his city pay for the repairs and appeared in front of the statue to inspect the progress of the work. 4. Romero tributes in mass media. In the digital age, tributes can take varied shapes and forms. In April, the release of Monseñor: The Last Journey of Oscar Romero on DVD won praise for combining archival film and voice recordings to let Romero speak again: “Thirty-two years after his assassination, one would presume that there was no footage and that no such film would ever appear,” wrote John Dear, “But here he is, gentle and humble -- and larger than life.” The documentary was featured at Notre Dame’s annual “Romero Days” conference. In November, The Project released their album, Martyrs Prayers, with a powerful anthem called “Romero” that we expect we will hear more about in the coming year. 5. Romero crops up in U.S. presidential campaign. During the often contentious presidential race, a story made the rounds questioning the Republican candidate’s possible connections to investors associated with Salvadoran death squads and to the Romero assassination. But there was never any evidence of direct involvement in death squads by the investors or that Gov. Mitt Romney knew very much about their activities in El Salvador. The story never broke through as a major campaign issue. 6. 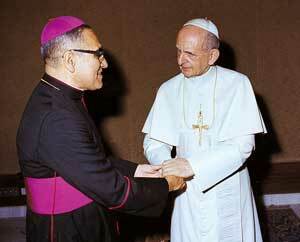 Romero absent from papal Latin American jaunt. Pope Benedict XVI visited Mexico and Cuba in March and he was on the Latin American soil on March 24—the first time a Pontiff had been on the Continent during the anniversary. However, unlike the Pope’s 2007 trip to Brazil, when a reporter’squestion prompted an impromptu commentary by Benedict on the canonization cause, this time there was no mention of Romero at all. 7. Romero canonization cause at a standstill. Analysis in the press, including in this blog, concluded that forward movement in Archbishop Romero’s beatification had ground to a halt—perhaps because of the complexity of the studies needed, perhaps because of the heavy workload at the Congregation for the Causes of Saints and staffing issues at the CCS, perhaps because of lack of interest at the top, perhaps all of the above. 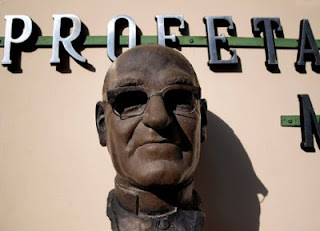 There is much reason to think any setback will be temporary, chief among all the reasons being the fact that a “Saint Romero” would be such a great asset to a Church sometimes desperately in need of one. 8. New Prefect of the Congregation for the Doctrine of the Faith. The new doctrinal watchdog for the Pope wrote only last year that, “Archbishop Romero is truly the voice of those without a voice, and thus an advocate of the poor and an example to every bishop as a defender and father of the ‘poor, homeless and neediest of all’,” as every bishop is called to be during his ordination. Msgr. Gerhard Ludwig Müller, a German, is close to both Pope Benedict XVI (Müller edited a recently published collection of Benedict’s writings) and to Gustavo Gutiérrez, the so-called Father of Liberation Theology. 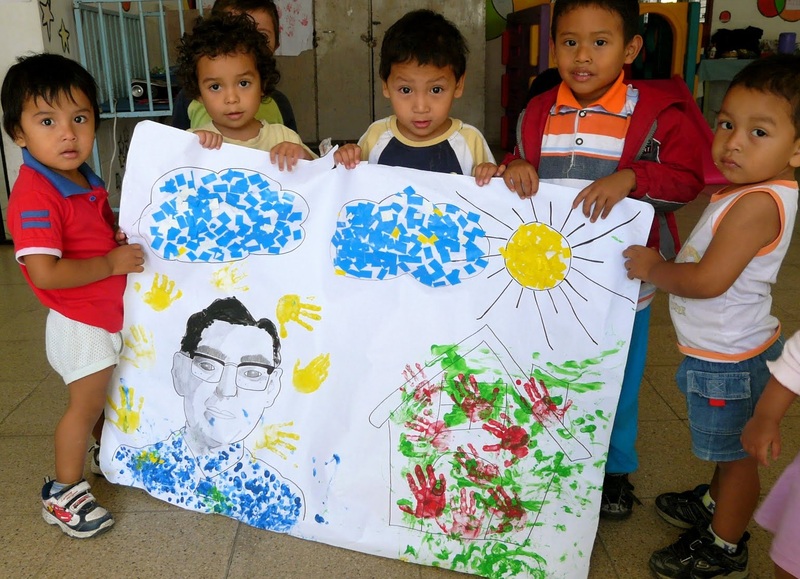 The CDF is the Vatican agency currently reviewing Archbishop Romero’s beatification file. 9. Postulator of Romero’s canonization on the rise. The Church official responsible for promoting Archbishop Romero’s sainthood cause was made an Archbishop in August, was appointed to head the Vatican equivalent of a cabinet-level agency, and is “on track to become a cardinal at an upcoming consistory,” according to a noted Vaticanista. Msgr. Vincenzo Paglia is president of the Pontifical Council for the Family, a key position given the Pope’s emphasis on resisting attempts to redefine marriage laws, among other things. We only question whether Archbishop Paglia’s ever-expanding task list will leave him with time or energy to devote to Romero’s cause (see item no. 7). 10. The role of the Salvadoran Church in the post-Romero era. Gustavo Gutiérrez said that, “The history of the Church in Latin America will be divided into before and after Monsignor Romero.” Perhaps nowhere is this more true than in El Salvador, where the church made news this year in ways that had not been seen since the war—though, not always in good ways. At the turn of the year, Archbishop Escobar Alas attracted universal reprobation for ordering the destruction of a major artwork adorning the Cathedral without regard for the cultural value of the work. Throughout his ministry, Escobar has held a much higher profile than his two predecessors, frequently commenting on social and political issues. In February, the military chaplain Bishop Fabio Colindres, helped negotiate a gang truce that led to a substantial drop in homicides. The higher profile may signal a new awakening for the Salvadoran Church, after a prolonged quietude in Romero’s wake. Finally, in this blog, we featured two special projects, in addition to the beatification watch stories we report from time to time, and the beatification prospects report at the beginning of the year. In addition to those, our approximately 60 postings included a special series comparing Archbishop Romero to other outstanding Catholic of recent times, in order to show where he figures in the Catholic world. We also updated our study of his seven last sermons with a special focus on Romero’s often overlooked criticisms of the left contained in the homilies he preached in the last 40 days of his life (his «Quaressima of Love»). Mons. Romero aseveró que “el gran consuelo” al enfrentar la probabilidad de que sería asesinado es que “la palabra queda” y su mensaje cristiano tocaría “los corazones que lo hayan querido recoger”. (Homilía del 17 de diciembre de 1978.) Las palabras de Mons. Romero verdaderamente han perdurado, y la evidencia de que la palabra de Mons. Romero «queda» entre nosotros surge a veces de sectores inesperados. De vez en cuando examinaremos en este espacio, frases romerianas citadas por algún comentador para tratar de iluminar los diversos contextos. Ahora, sin dar ni restar respaldo alguno al comentarista Avilés, sí podemos constatar que hace un uso correcto de esta frase de Mons. Romero—es decir, le da su interpretación correcta y la aplica a una circunstancia en que parece apta para el argumento. De hecho, la situación que describe Avilés sobre la aplicación de las leyes en contra del narcotráfico en barrios pobres encaja perfectamente con la situación original que examinaba Mons. Romero en agosto del 78, la primera vez que utilizó esa frase, en torno a la Ley del Orden Público y el ab/uso de esta para amedrantar a los pobres. En sus demás comentarios, Avilés da a conocer que sus inquietudes son parecidas: “cuando veo esos operativos de la policía o la fiscalía botando una puerta de lámina en una zona marginal, una niña que le da miedo a las dos de la mañana, un abuelito que cae hasta con convulsiones al suelo cuando apresan a su familiar, una madre que grita, eso no puede ser, es ingrato” (LA PÁGINA, supra.) Avilés cuestiona, “¿cuándo vamos a ver este tipo de operativos en una casa de una manzana, donde tengan que botar un portón de hierro, automático?” (Id.) Lo único que le faltó a Avilés fue la comparación con una “culebra”, que le da aún más vigor a la expresión (especialmente teniendo en cuenta la simbología de la serpiente en la imaginería cristiana). Más importante aún, el uso de esa frase por parte de Mons. Romero revela algo de lo que la hace perdurar. Primero, su aplicabilidad a diversas situaciones. Esta adaptabilidad se pone en evidencia desde el uso de Mons. Romero, que la hace aplicable tanto a la Ley del Orden Público en El Salvador en 1977 cuanto a las admoniciones de Malaquías en contra de los sacerdotes judíos en tiempos bíblicos. Segundo, la frase celebra la sabiduría de los pobres, ya que cita las palabras de un campesino, y revela una verdad sencilla pero también por ende innegable. Esto le habrá gustado a monseñor, ya que él creía que los pobres eran personas muy dignas con mucho que enseñar al resto de la sociedad. Tercero, la sencillez y validez de la frase cuadra con la sencillez y la validez de las frases de las Sagradas Escrituras, incluyendo las parábolas que usaba Cristo para enseñar, ya que estas también fueron dirigidas a personas sencillas y pobres. Por ende, suelen prevalecer entre las imágenes utilizadas, las de fieras del campo y víboras, tanto como referencias desde la agricultura. Cuarto, la frase cuadra con la idea de Mons. Romero pronunciada en Lovaina, de que el Evangelio ilumina la situación de los pobres y de manera complementaria la vida de los pobres puede iluminar la verdad que del Evangelio. En este caso, el arzobispado trataba de estudiar la aplicación de la Ley a los pobres desde el Evangelio, y después utilizaba una frase de esos pobres para tratar de entender las admoniciones de Malaquías. Y quinto, la frase es urgente, haciendo un resumen eficaz de una situación apremiante y real; y desde ese fundamento en la realidad cobra su vigencia y actualidad. En fin, la frase de que «la ley es como la culebra, sólo muerde a los que andan descalzos», es una palabra auténtica de Mons. Romero—algo que él dijo, y que refleja la denuncia profética, evangélica que él hacía de la realidad. Pope Paul VI, the spiritual mentor and strong supporter of Archbishop Romero, has been approved for beatification, according to reports. The Prefect of the Congregation for the Causes of Saints, the Vatican agency charged with recognizing new saints, met with Pope Benedict XVI and reported that separate commissions, one composed of theologians and another made up of cardinals and bishops, had both reached the same conclusion—that Giovanni Battista Montini, who reigned as Pope Paul VI between 1963 and 1978—meets the requirements of “heroic virtue” to be recognized as a saint. The process for ultimate recognition as a saint is a long one, with additional procedural hurdles to clear. Pope Paul will be called “venerable” now, and he could be called “blessed” and “saint” in separate stages, each requiring the recognition of a miracle attributed to his intercession. In fact, Pope Paul was a father figure to Romero, to Pope John Paul II, and to the current pope, as Paul was twenty years their senior, and he created John Paul and Benedict as cardinals, as well as sponsoring Romero in his various promotions. In his own encyclical on social issues, «CARITAS IN VERITATE,» Pope Benedict says that Paul, “identified the heart of the Christian social message” and praises him as the most influential pontiff on social issues since the 19th Cent. Pope Leo XIII. The advance of Pope Paul’s beatification must necessarily contribute to Romero’s own beatification process. Questo post ha stato originariamente pubblicato nel blog di Olivia Amadon e, più recentemente, nel Tim's El Salvador Blog. Tim è il Presidente del Movimento per il Volontariato Missionario. Perché Romero ha stato associato con la Giornata dei Missionari Martiri, questo mostra come l'appello di Romero è in crescita, anche tra i bambini. «Monseñor ROMEEEEROOO!» grida un coro di bambini. «E chi è Monsignor Romero?» chiede la folla in assemblea del mattino di Lunedi. Uno dopo l'altro i ragazzi coraggiosi corsa verso il microfono, entusiasta di essere in grado di parlare (o urlare) in un attimo. —... Ih .. lui ... ehm ... lo hanno ucciso perché ha detto la verità! —Era un uomo che amava visitare le comunità! Materno II: i ragazzi da circa 2 e mezzo a tre anni e mezzo, hanno una piccola drammatizzazione.Ora tenere a mente che si tratta di bambini, la maggior parte dei quali a malapena sono in grado di parlare udibile. Ma anche bambini di tre anni può capire cosa significa condividere con i poveri, per portare vestiti e medicine e cibo ai poveri, e dire la verità. Edrian Ely, uno dei miei preferiti (non dire agli altri), non parla. Ha una disabilità fisica che ha ritardato il suo sviluppo del linguaggio, ma è estremamente luminoso, amorevole, ragazzo poco energico. ha svolto il ruolo di Romero in la drammatizzazione di Mercoledì mattina nell Materno II. Portava un cesto gigante intorno al palco, pieno di vestiti, toy cibo, e medicine. Andò alle comunità. E come Señorita Lucy narrato («Monsignor Romero amava visitare le comunità ... amava condividere la Parola di Dio ... e ha sempre ascoltato quello che i poveri gli ha detto ...»), Ely agita le sue parole, visita i gruppi di bambini sul palco, dando loro ciò che ha portato nel suo cesto, seduta sul pavimento e sfogliando una Bibbia. E qual era la parola di Dio che Romero ha predicato, secondo Materno II? Dobbiamo sempre condividere ciò che abbiamo, anche se abbiamo solo un po ', e dovremmo sempre dire la verità, anche quando abbiamo paura. La recientemente publicada nota sobre la masacre de Tres Calles en este blog expone la tesis de que la reacción de Mons. Romero a aquella masacre dada en 1975 no fue una “oportunidad perdida” para poner en acción la doctrina social de la Iglesia pos Medellín por parte de un prelado tímido y conservador, sino más bien un desarrollo decisivo por parte de Mons. Romero de su pensamiento que sentó un importante antecedente para su línea pastoral como arzobispo. Esta ponencia busca robustecer esa tesis con algunos datos adicionales. Uno de los argumentos que avanzo en mi ponencia anterior es que al reaccionar a la masacre de Tres Calles, Mons. Romero estaba actuando en un dado momento histórico, y que no cabía en 1975 reaccionar con la misma contundencia que sería adecuada, digamos, en 1977, porque en 1975 la figura de «la masacre popular» todavía era novedosa. Esa aseveración se justifica a base de los patrones de «protesta» en el ámbito social de ese tiempo. El siguiente cuadro de Paul Almeida ilustra las manifestaciones en El Salvador entre 1972 y 1977, tanto en el número de manifestaciones (línea en trazos) cuanto en el número de manifestantes (línea sólida) que participaban en las manifestaciones entre esos años. El gráfico demuestra que entre los fraudes electorales de1972 y 1977, respectivamente, hay una baja precipitosa en protestas, y la reacción de Mons. Romero en 1975 cuadra con este patrón. No era una época de protestas. 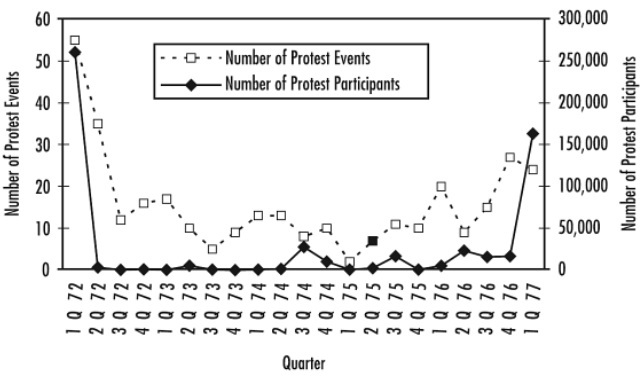 ALMEIDA, “Wavesof Protest: Popular Struggle in El Salvador”, 1925-2005, editorial de la Universidad de Minnesota 2008, pág. 124, cuadro no. 20. 3) Debe considerar si o no el Prelado está “seguro de los verdaderos móviles del acontecimiento [y] de la conducta privada de los interesados”. Carta de Mons. Romero a Sus Excelencias Mons. Luis Chávez y González, Mons. Benjamín Barrera y Reyes, Mons. Pedro Arnoldo Aparicio, Mons. J. Eduardo Álvarez, Mons. Arturo Rivera y Damas, y Mons. Marco René Revelo, publicado en Diez & Macho, “En Santiago de María me topé con la Miseria”, editorial Criterio, San Salvador, 1995, pág. 47. Mons. Romero consideraba que estos tres elementos no habían sido rellenados por los hechos de Tres Calles, pero en 1977, un mes después de asumir como arzobispo, se le presenta un caso que sí satisface a la saciedad estos criterios—el asesinato del P. Rutilio Grande. En el caso Grande, Mons. Romero ya no puede confiar que la forma “más eficaz” de “deducir responsabilidades y resarcir en lo posible el mal causado” es escribiendo una carta privada al Presidente, porque esa misma táctica no le dio resultado en el caso de Tres Calles. Los otros dos puntos son rellenados de manera contundente: es un caso en el cual está “implicado directamente en el asunto problemas de la Iglesia”, ya que es un sacerdote el que ha sido asesinado; y Mons. Romero puede estar “seguro de los verdaderos móviles del acontecimiento y de la conducta privada de los interesados” ya que se trata de su gran amigo, y Mons. Romero conoce las amenazas en su contra, que el móvil detrás de las amenazas es la falsa sospecha de avocación comunista, y Mons. Romero conoce la conducta privada del P. Grande, ya que es su amigo, y sabe que las acusaciones son difamatorias. Desde este análisis podemos ver que los elementos sentados en Tres Calles le sirven a Mons. Romero de plena justificación para definir su reacción en el caso del P. Grande. En el caso Grande, Mons. Romero recurrió a ciertas de las mismas acciones que había tomado en el caso Tres Calles: llevó a cabo una investigación privada de los hechos para tener un balance de estos; escribió una carta privada al Presidente pidiéndole una explicación, y concelebró una misa con otros sacerdotes para encomendar las almas de los difuntos al Señor. En el caso Tres Calles, Mons. Romero, como Obispo se hizo presente en la misa de sepelio de los difuntos, y concelebró con varios otros sacerdotes allí presentes. “Alguien me sugirió que era mejor no ir por peligro de una manipulación política de mi presencia”, confiesa en su memorando a la CEDES, pero defiende su intervención y la de los otros sacerdotes (“sólo un gesto de solidaridad”). Si tuvo alguna renuencia, “[ú]nicamente hubiera querido que los cantos no fueran los conocidos 'de protesta'”. Diez. Esa misma sensibilidad por no confundir lo sagrado con lo profano la tuvo hasta sus días de arzobispo, cuando se molestó que en el funeral del padre Ernesto Barrera se cantaran consignas políticas: “Entonces Romero agarra el micrófono y dice, visiblemente enfadado: por lo menos esperen a que yo termine de dar fin a esta santa misa; después, ahí en la calle, griten las porras que quieran, pero aquí adentro no”. (EL FARO.) Pero en el caso Grande, Mons. Romero también practicó otras tácticas que no había utilizado en el caso Tres Calles, por las diferencias ya notadas: rompió relaciones oficiales con el gobierno, hizo pública sus demandas en el caso, y presidió una «Misa Única» en Catedral. Sin embargo, estos actos simbólicos resultaron los más comentados y significativos en su impacto. 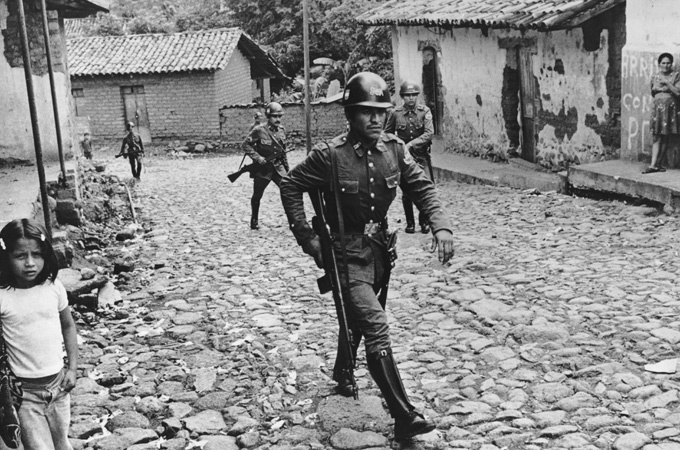 Salvadoran National Guardsmen, stock photo. Less than two years before the assassination of Fr. Rutilio Grande, Óscar Romero had to react to an extrajudicial killing by the Salvadoran army. Most historians view the killing of Romero’s friend, Grande, in March 1977 as the turning point in Romero’s “conversion” to a prophetic ministry of public denunciation of government atrocities, and they see his reaction to the June 1975 Tres Calles massacre in Romero’s previous diocese as a study in contrast—a timid, conservative, and inadequate response. Tres Calles is presented as a missed opportunity to implement the teachings of the Medellín Bishops Conference, which Romero later took up with aplomb. In actuality, Tres Calles was a decisive step by Romero on his prayerful but unstoppable march toward San Salvador. Although Romero followers and Salvadoran history buffs have heard about the Tres Calles Massacre, at least in passing, this incident from Romero’s years as Bishop of Santiago de Maria (1974-1977) is overshadowed by events from Romero’s period as Archbishop of San Salvador (1977-1980). In 1975, the ruling class of El Salvador was trying to make the country a showcase for all the world. The Miss Universe pageant was held in San Salvador in August of that year. Behind the scenes, security forces loyal to the oligarchy tried to squash all hint of rebellion or discord, brutally repressing a student protest in July, and, in June, after activists blocked the coastal highway to protest the high prices of basic staples, the National Guard hit back by going into the neighborhood (“Tres Calles”) where the organizers lived and killing six peasants—none of them involved in the protests, but related to the demonstrators. Bishop Romero went to the scene of the crime the morning after finding out about it, late at night. What Romero found shocked him to his core. After consoling the families, he interviewed numerous witnesses and wrote up a report. In fact, what we know about the incident comes from his report. Romero’s write-up is drafted with an objectivity that recalls the U.N. Truth Commission’s summary of the El Mozote massacre, written nearly two decades later. “On Saturday June 21, 1975, at one o'clock in the morning,” Romero wrote, “approximately 40 National Guard officers accompanied by two unidentified civilians riding in several vehicles blasted into the Tres Calles hamlet of San Agustín (Usulután Province) and violently entered the dwelling of José Alberto Ostorga, 58, while the remaining officers surrounded the house.” (Diez & Macho, “En Santiago de María me topé con la Miseria,” Criterio Press, San Salvador, 1995—Compare the U.N.’s similar matter-of-fact intro to El Mozote: “On 10 December 1981, in the village of El Mozote in the Department of Morazán, units of the Atlacatl Battalion detained, without resistance, all the men, women and children who were in the place.”) Romero described the atrocity with a cold, forensic precision that gives credence to his description of the events: “They bound Mr. Ostorga and his 28 year-old son who shares his name, and they took them outside of the house together with Santos Morales, 38, to his house, located about 20 meters from the Ostorga house. Soon thereafter, the three were killed by machine gun fire about 200 meters from the house, and afterward they were hacked by machete throughout their bodies and heads.” (Diez & Macho, Id.) He also described two other killings and other abuses. When Father Grande was killed two years later, Archbishop Romero also sent a private letter to the President asking for redress. This letter was more emphatic and, although the letter itself was not published, it had very public repercussions. Romero’s tone was markedly different now. “A number of commentaries are being made regarding this incident,” he wrote the President, “many of them unfavorable to your government.” Romero added that, “The Church is not willing to participate in any official act of government while it does not make every effort to make justice shine over this outrageous sacrilege that has shocked the entire Church.” (EL FARO.) Romero kept his promise. Romero’s different reaction to Tres Calles and events such as the Grande assassination are explained by differences between the cases, as Romero explained in a memo to fellow bishops at the time of the Tres Calles incident. First, it must be noted that massacres were a new development in El Salvador in 1975. 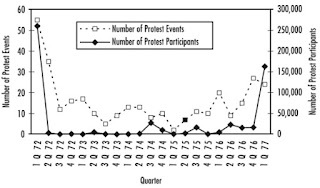 See, Almeida, Waves of Protest: Popular Struggle in El Salvador, 1925-2005, University of Minnesota Press 2008, p. 124 (“[F]rom 1962 to 1971, it is difficult to document a case of government agents killing more than three persons at a time,” but such killings spiked in 1975). As such, it is not valid to compare Romero’s reaction to Tres Calles, which was a case of first impression, to his reaction much later when distinct patterns of violence had emerged. Romero saw Tres Calles as a sui generis event for which the most efficient recourse was a private complaint, geared toward obtaining concrete results for the affected families. Second, Romero tells the bishops, he did not make a public statement because the incident did not involve the Church directly. As Romero later said to explain his more public stances (paraphrasing Pope Pius XI), “The Church is not involved in politics, but when politics touches the altar, the Church defends the altar.” (May 8, 1977 Homily.) He similarly justified his very public reaction to the Grande assassination: “one who attacks one of my priests, attacks me.” (March 20, 1977 Hom.) Third, Romero felt constrained in reacting to Tres Calles by his lack of background knowledge. “I am still not sure about the real motives of the event or the private conduct of the victims,” Romero stated. (Diez & Macho, Id.) By contrast, when Romero denounced atrocities as archbishop, he assembled a legal team to investigate and verify the underlying facts and he liked to boast that no one ever proved an error on his part. Most importantly, Tres Calles was a shock to Romero’s system, which reshaped his views of oligarchic military rule in El Salvador and propelled him toward his prophetic ministry in San Salvador. “It tore my soul apart,” Romero wrote the President, “to hear the bitter weeping of widowed mothers and orphans, who narrated the cruel blow … between incontrollable sobs and bewailed the state of orphanage in which they had been left.” (Id.) He had been “no less struck,” Romero said, “by the semblance of terror and indignation reflected in the numerous faces” of the peasants he met with. (Id.) That October, Romero issued a statement saying that, “Before the ambition for power and money, let us cultivate a sense of service and solidarity, to empathize with the needy and effectively assist them to gain full realization in a peaceful society ordered in justice.” (Collected in “Praxis del Martirio,” CEPLA Bogotá 1977, p. 109.) It was now sixteen months until the assassination of Rutilio Grande. La Virgen de Guadalupe nos está diciendo que la Iglesia en América Latina debe ofrecer al continente un cristianismo con “la fisonomía propia de nuestra idiosincrasia”, predicó Mons. Romero en su Homilía Guadalupana al final de su primer año arzobispal. (Este es una ponencia en la serie sobre los grandes sermones de Mons. Romero. Leer el texto de la homilía en español aquí, y en inglés aquí.) “María acudió a la montaña del Tepeyac para presentarnos una presencia de la Iglesia, con fisonomía muy propia”, explicó monseñor. “No era una mujer europea, ni una india de nuestro continente recién descubierto [sino que] la expresión del mestizaje, la raza nueva que en aquel momento surgía en la historia” y por ende, la Madre de Dios estaba mostrando que la Iglesia debe identificarse y encarnarse con los pobres, debe insertarse en la historia, y debe impulsar su evangelización junto a la promoción integral, apuntó. La advocación mariana de la Iglesia Católica que afirma la aparición de la Virgen María sobre el cerro del Tepeyac en el siglo XVII sostiene que la Madre de Dios se le presentó al indio Juan Diego envuelta en luz, pero luciendo piel morena, rasgos mestizos y hablando en Nahuat, el idioma indígena de la región. Esta apariencia de la Virgen, adaptada a la realidad local, es una muestra de opción preferencial de la Madre de Dios, quien “cuando viene a América, su diálogo de íntimo sentido maternal hacia un hijo lo tiene con un indito, con un marginado, con un pobrecito”. Señala monseñor: “Así comienza el diálogo de María en América, en un gesto de pobreza” y recuerda el significado teológico del estar desprendido de las riquezas y las cosas materiales. “Pobreza que es hambre de Dios, pobreza que es alegría de desprendimiento”, dice monseñor. “Pobreza es libertad, pobreza es necesitar al otro, al hermano y apoyarse mutuamente para socorrerse mutuamente. Esto es María y esto es la Iglesia en el continente”. Haciendo recuerdo de la «ECCLESIA IN AMERICA», el Papa Benedicto XVI también ha reconocido la necesidad de examinar la realidad cotidiana a la luz de la fe: “¿Cómo no preocuparse por las dolorosas situaciones de emigración, desarraigo o violencia, especialmente las causadas por la delincuencia organizada, el narcotráfico, la corrupción o el comercio de armamentos?”, cuestiona el Pontífice: “¿Y qué decir de las lacerantes desigualdades y las bolsas de pobreza provocadas por cuestionables medidas económicas, políticas y sociales?” (Discurso 9 dic. 2012, id.) Y en ese sentido, nos predica Mons. Romero, la Virgen de Guadalupe “es la imagen también, un reclamo, de una Iglesia que está presente con la luz del evangelio como Dios la quiere, en la civilización de los pueblos, en las transformaciones sociales, económicas, políticas”, ya que “no se puede prescindir de un Evangelio que nos amamantó, no podemos traicionar una Iglesia, un Dios que nos ha dado los secretos de los verdaderos caminos por donde los hombres se hacen felices”. Finalmente, todos deben acoger esta enseñanza de la Virgen porque todos en América Latina la aman, confía monseñor. “Nadie se ha metido tan hondo en el corazón de nuestro pueblo como María”, asegura el Obispo Mártir. “Bendito sea Dios, hermanos, que la Virgen de Guadalupe es todo un signo de nuestra religión”, se regocija Mons. Romero. “Tratemos de imitarla, que nuestra presencia aquí no sea solamente una procesión folclórica sino que sea una reflexión profunda para vivir como Ella, insertos en la sociedad, pero llevando a ella la sal de nuestra fe, y promoviendo esos cambios profundos que nuestra sociedad exige para no vivir en un ambiente de pecado sino para convertirnos a la verdadera redención”. Al final de cuentas, “Una Iglesia al margen de la historia no sería la Iglesia redentora de los hombres” y no estaría en sintonía con la Virgen de Guadalupe. “Una Iglesia que quiere estar presente, como María, en el corazón de cada hombre y en el corazón de cada pueblo es la verdadera y auténtica Iglesia de Cristo”. Mons. Romero nos invita a que “unidos con María, la gran devota, la gran cristiana, la gran latinoamericana, la Virgen de Guadalupe presente en el alma de cada uno de nosotros” nos unamos a la vida sacramental y evangélica de su Iglesia. Este post está dedicado a Duane y Janet Arnold. Duane es uno de los protagonistas del conjunto The Project, y Janet es una «lupita».